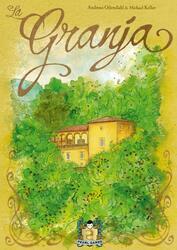 In La Granja, the players run small farms in the Alpich hamlet near the village of Esporles on the island of Mallorca. For a part of the year, they make their farm prosper by buying fields or building expansions. They also compete for the best deliveries of goods to the village. Speed will be a key factor for success! Granja is a deep game that requires meticulous planning. To win, players have all the tools they need to deal with the hazards of dice and cards. Each part will be unique!